2019 is just getting started, and the first big movie up to bat is Glass. The original superhero film is the long-awaited sequel to 2000’s Unbreakable. But that’s not all! The film also takes the characters from 2017’s surprise hit Split and crosses them over with Unbreakable. It’s been 18 years since the last time we saw David Dunn (Bruce Willis) and Elijah Price (Samuel L. Jackson), so there’s a pretty solid chance not every fan is up to date for Glass. Unbreakable was M. Night Shyamalan’s follow up to The Sixth Sense and was a superhero movie that took an ultra-serious approach to these protagonists before it was fashionable to do so. 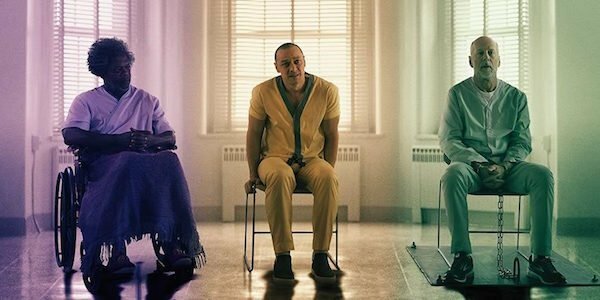 2016’s Split ended up being a secret spinoff of Unbreakable, and now Glass will unite the two casts of Shyamalan’s superhero universe for one big showdown. Here’s everything you need to know before catching the film on January 18. Let’s appropriately start with the main character of Unbreakable, David Dunn. Played by Bruce Willis, David thinks he’s just a regular security guard, quietly ignoring some signs to the contrary. Early in the film, David is the only survivor of a devastating train accident without a single injury. As he comes to discover throughout the film, he can’t be hurt, possesses abnormal strength, has a kind of danger sense and can see visions of crimes committed by those he touches. For the most part, David denies that there’s anything special about him, but he eventually begins to use his new abilities to fight crime, initially with the help of a new friend. Elijah Price was born with a rare disease that renders his bones extremely fragile and prone to fractures. If he were to so much as stub his toe, his whole foot could break. Elijah grew up obsessed with comic books and opened his own comic book art gallery, eventually crossing paths with David. Elijah suspects that David has superpowers and works with him to try and figure out his abilities and weaknesses using comic book logic. For example, Elijah figures out that David has a weakness to water. Elijah comes off a bit too obsessed at times, but there’s a pretty good reason for that. The big twist of Unbreakable is that Elijah is the one who orchestrated David’s train crash and dozens of other “accidents.” Given that he is extremely fragile, by comic book logic, Elijah figured that his polar opposite must exist as an unbreakable man. Elijah caused the accidents, killing hundreds of people, in an attempt to find this person. While helping David realize his true purpose, Elijah learned of his own: to be the villain to David’s hero. He adopts the name Mr. Glass, which is what bullies would call him as a child. Elijah pretty much freely tells David all of this and David turns Elijah into the police. Elijah was tried for his crimes and sent to an insane asylum, where he seems to remain until the events of Glass. Split is a standalone sequel to Unbreakable and can be considered a villain origin story. The story features Kevin Wendell Crumb (James McAvoy), a man whose body chemistry changes for each of his 24 unique personalities. Some of these alter egos are good, others are bad, and some are REALLY bad. The worst personality is simply known as The Beast, a monstrous persona that grants Kevin superhuman abilities, such as super strength and invulnerability. Oh, and he likes to eat people. The Beast is the main bad guy and physical challenge for David, and the two of them will be squaring off in Glass, to the glee of Mr. Glass. It wouldn’t be a true crossover if there weren’t some familiar faces. Asides from the obvious David, Mr. Glass, and The Beast, a few other characters will be appearing. For starters, Anya Taylor-Joy’s Casey is back. Clare was abducted by one of Kevin’s personalities in Split as a sacrifice for The Beast, but she managed to outwit and escape certain death… until she gets dragged into a whole new conflict. Spencer Treat Clark is also back as David’s son, Joseph Dunn, after playing the role as a kid in 2000. Joseph always believed in his dad’s abilities and we’ll see how that faith holds up as an adult. Joining Clark is Charlayne Woodard, who plays Mrs. Price, Elijah’s mother. Our main trio of characters were in a few different places when we last saw them. In the case of Kevin/The Beast, he had escaped capture and was still at large at the end of Split. David Dunn saw a news report of The Beast’s actions, setting up a confrontation between the two. It’s not clear what David’s been up to for the past 18 years, but the ending of Unbreakable implied that he would continue his vigilante duties, so stopping The Beast would be on his to-do list. As for Elijah, he was sent to an insane asylum for the criminally insane, but bars don’t seem to be much of an issue for a master manipulator like Mr. Glass.